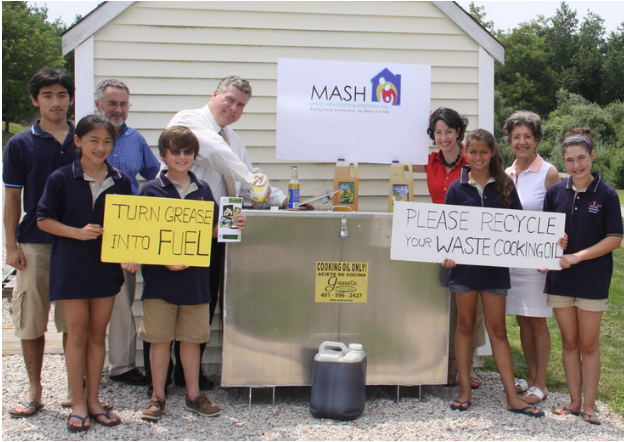 Cassandra Lin, a Westerly 7th grader, found the solution to many problems at once when she co-founded Project T.G.I.F (Turn Grease Into Fuel). While attending the Rhode Island Green Expo in 2008, Lin learned it is possible to turn cooking oil into biodiesel fuel. She was also aware that her community had a program for helping those in need with heating oil during the winter. Project TGIF arranged to work with Newport Biodiesel to create a system in which TGIF signs up restaurants to donate cooking oil and Newport Biodiesel processes the oil, and then donate the recycled oil to local charitable agencies, who distribute it to clients. Through April 2017, Project TGIF has donated over 51,500 gallons of BioHeat to local charities in Rhode Island, heating the homes of 515 local families, valued at over $190,000.